Ever given a user a new machine and they confirmed all the software they need is available? How many followup tickets after that for things that they missed? 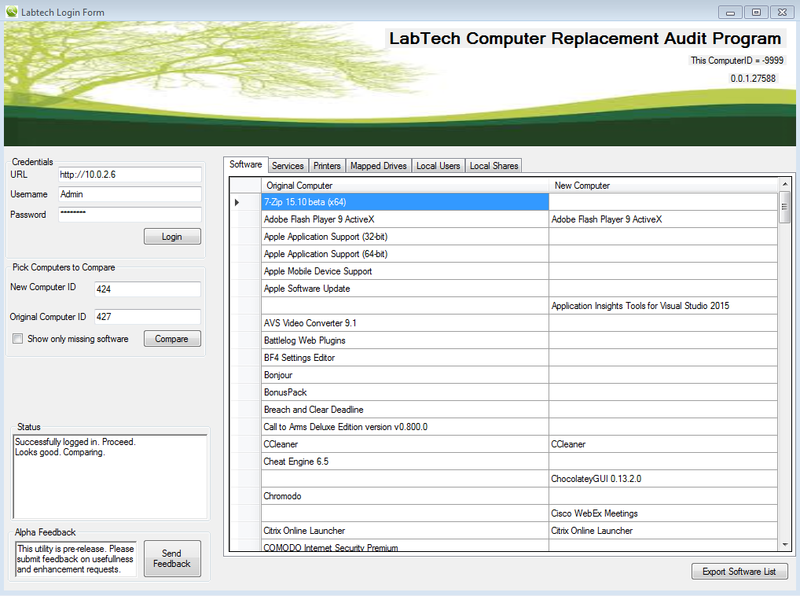 This is a standalone utility that you can use to compare the software list on two machines, and provide a report for the end user to review all the missing software. Think: You: "I see you had Apple Sync on your old computer, do you use that?" You can also use this as a pre-scan - You: "Before I order the new computer, can you mark on this list all the software you use?" Enter 'New Computer ID' and 'Original Computer ID' as the same id will show you a list of all the software on the machine. Fantastic! This saves me a lot of time from having to do the manual work with dataviews. Kudos! Nemsys ............ this is awesome. Quite likely one of THE most useful things I have used in quite a while. Our guys will like this one. Thanks for sharing. +1 for this, thank you! Looks great. Looking forward to testing it out. This is v1.0 and pretty light - only shows Computer Software Inventory. What else would be usefull? One bug we came across is: When it autodetects the LT site, we are using https://mysite.whatever|https://24.220... and it has issues because of this. You could do a split on | and take the first address only and it would correct the issue. 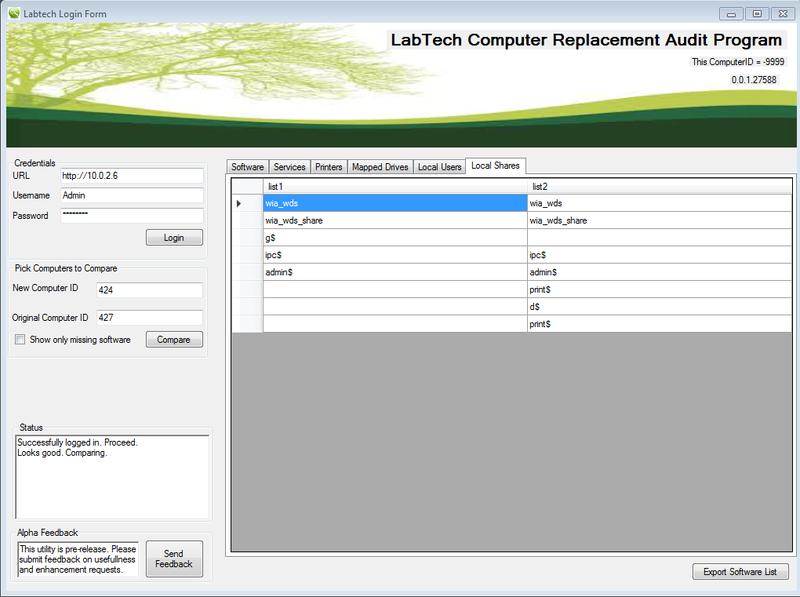 Addressed issue with | in the LabTech FQDN. Note: will default to the first named FQDN. When there are no mapped drives it throws an error, is it supposed to do that? This is awesome! We are going to use that! - If possible to export it to Excel instead of XML then open in excel with specific format, I think it would be more flexible to edit later. I didn't test those when I added the new features! I'll get an update out shortly. Should be fixed - get the latest build. Nope! I didnt test that condition. I'll get an update out shortly. 1: Export error Should be fixed! Get the latest build! Awesome this will be great. PM me if you find any issues. So - whats next? What would you want to see next? Ya, I have not figured out why yet. And it doesn't do it on all webroots - but Have seen the same issue, on my desktop Webroot doesnt see it, on my Laptop it does. I've submitted to Webroot, and they have tested and cleared it for whitelisting! Scan again and it should be clean. Looks nice, we don't have that sort of issue, but I just wanted to give you a HUGE kudos for the Acronym. CRAP << awesome, I'm giggling like I'm a six year old. Can it be complex password used for the account?